Google just released the Nexus 4 which runs on the newest Android 4.2 Jelly Bean. As for what’s new features for Android 4.2, you may visit for details. After you know Nexus configuration, you will have no idea which one to choose from Nexus and iPhone 5. Now Let watch the picture below which compare the configuration details. The LG Nexus 4 has a Qualcomm APQ8064 Snapdragon S4 Pro processor with 1.5GHz Quad-Core Krait CPU as well as a Adreno 320 GPU. Nexus 4 also get you 2GB RAM. The iPhone is equipted with a A6 chipset with 1.2GHz dual-core CPU and of course the PowerVR SGX543MP2 GPU, but the iPhone only has 1GB RAM. For this point,Nexus 4 wins this one with 2GB RAM. 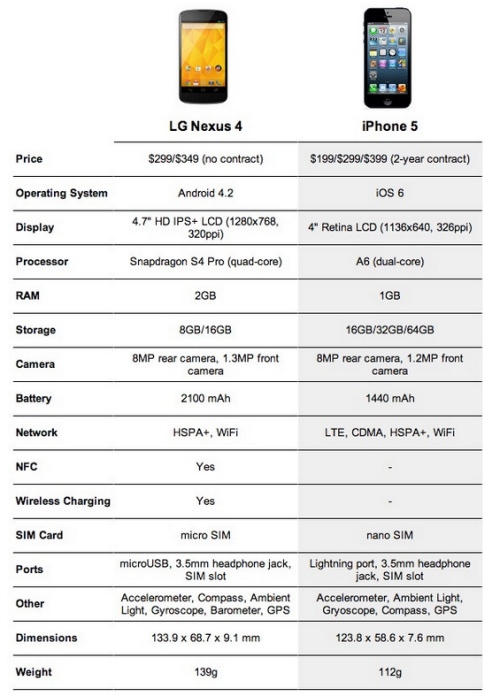 Nexus will run faster than iPhone 5. The Nexus 4 provide 8 or 16GB, the iPhone 5 provides 16, 32 and 64GB versions. You have to keep in mind that both smartphones do not have a card slot for extra memory, so it is the iPhone 5 that wins in the storage sector.But if you don’t need that much storage, Nexus 4 is a good choice. When it talk about the screen,it is a really hard one to choose. the Nexus 4 comes with 4.7-inch True HD IPS Plus display with 1280 x 768 pixel resolution (320 ppi – it is in fact 318 to be precise) and it also get Gorilla Glass 2 to protect it. The iPhone 5 has a 4-inch LED-backlit IPS TFT display featuring 326ppi pixel density with 640 x 1136 pixels and also has Gorilla Glass. They have almost the same display effects. So it depends on what size screen you want. The Nexus 4 gets an 8-megapixel rear camera and a 1.3MP at the front which also enable you play with the cool Photo Sphere, geo-tagging, LED flash, face detection, touch focus and full 360-degree panoramic photos. It will also take great shots in low-level lighting. The iPhone 5 also has an 8-megapixel on the rear and a 1.2MP on the front, as well as 1080P HD video, geo-tagging, HDR, panorama, LED flash, autofocus and face detection.The only difference is that you have to use iTunes to export taken pics and videos, while Nexus goes directly. Nexus runs on Android 4.2(jelly bean),it gets new features like Full Chrome browser,Gesture Typing,Multi-User Tablets,Resize-able Widgets,Android Beam etc.IOS 6 get new features like Passbook,Siri,Do-Not-Disturb screens,Shared Photo Streams,FaceTime over cellular,Phone & DND etc. What’s more, you all know Android 4.2 is using Nokia maps which works better than Apple Maps. These are the key points to consider when you want to buy between Nexus 4 and iPhone 5.One point forgotten, Nexus 4 is more cheaper than iPhone 5.